LogMeIn integration with allows you to provide remote support to your customers and log session messages back in HappyFox. Create a LogMeIn Rescue remote support session from a HappyFox ticket. Directly share the remote support session link with the customer via a ticket-reply. Access Technician console using the link provided on a HappyFox ticket. 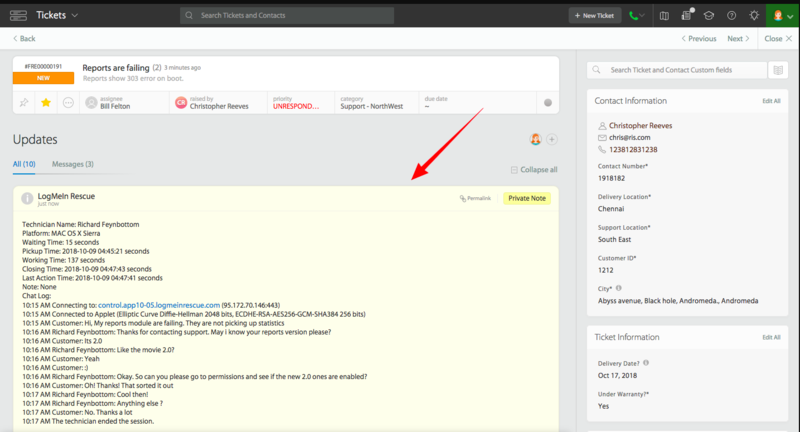 Automatically capture details about a remote support session including chat transcript as a HappyFox ticket update. You will need an active LogMeIn account to enable integration with HappyFox. Get the LogMeIn company ID and Employee SSO password. Install the LogMeIn app in HappyFox. Update the Post Session URL webhook inside LogMeIn. Go to secure.logmein.com and log in with your credentials. Go to the Administration Center. Click the Technician name on the left side menu. Click the Organization tab and enter the technician's LogMeIn account ID in the Email ID field and Single Sign on ID field. This will be the ID the technician must use to sign in while creating a session through HappyFox. Next, click on Global settings. Create an SSO password and confirm the same. Copy the company ID from the box below the password section. Go to Apps >> Remote Support >> LogMeIn Rescue. Provide the "Company Id" and "SSO password" obtained previously. Click Save to enable the integration. Copy the Webhook URL after successful installation of the logmeinrescue app. Go to your technician group >> Settings >> Exporting Session Data >> Post Session details to URL when the session is ended by the technician. Paste the Webhook URL copied earlier. The LogMeIn Rescue integration is now complete. Click "Add Session link to the ticket reply". If you would like to know how LogMeIn Rescue integration works with HappyFox Classic, please refer to the document attached.